When Jimmy Roberts organized the first trek in Nepal, independent trekking was a logistical nightmare – no lodges, email, fax or direct-dial telephones. Most trekkers, therefore, joined group camping treks organized by adventure travel companies abroad, a tradition that has carried over to the present day. Many trekkers still travel on group treks organized abroad, but it’s also possible to arrange an organized trek directly with a company once you arrive in Kathmandu or Pokhara. An organized trek can be either a lodge trek or a camping trek. The group size may be as large as 20 or as small as one. An organized trek is under the control of a sirdar (trail boss), who is responsible for arranging accommodation, whether it is a lodge or camping area, and ensuring a full complement of porters every day. If there are fewer than three trekkers, the sirdar will also serve as guide; with a larger group there may be several guides. On a camping trek the trekking crew will also include a cook and kitchen staff. Many people prefer to avoid the daily haggling for food and shelter. Most trekking companies offer a package that includes a guide, porter and accommodation for a fixed daily rate. Depending on the company, food may or may not be included in the cost. This arrangement works best with a single trekker or a group of less than five. A number of adventure travel companies offer escorted lodge treks, which they often call ‘teahouse treks’. Most companies take over an entire lodge for their group and provide all food and accommodation as part of the package. Porters carry your gear, and a guide travels with the group during the day and handles all the arrangements for meals and dealings with bureaucracy. This way of arranging your trek can be particularly useful in the busy autumn season, when lodges are full. Most group camping treks are organized in advance by adventure travel companies abroad. These companies provide extensive advice about equipment, health and travel, arrange flights to Nepal and ensure that everything works smoothly throughout the trek. If you have little or no experience travelling in Asia, consider joining one of organized treks. 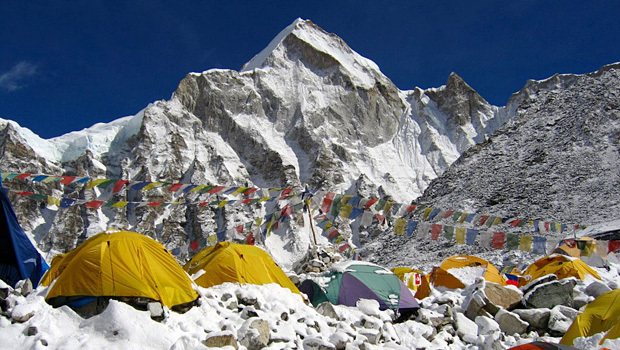 If you want to organize your own private camping trek, you would do best to contact a Nepal trekking company, or an adventure travel company in your own country, well in advance so the arrangements are complete when you arrive in Nepal. It takes a day or more to organize the gear and logistics for a camping trip. If you have not organized the trek in advance, you should be prepared to spend time in Kathmandu choosing a company and settling the details, and another few days while the company collects a sherpa crew and porters and transports them to the trailhead. A few Nepal companies do offer treks with fixed departure dates and these are advertised on bulletin boards and signposts in Thamel and the lakeside in Pokhara. These treks can turn out to be excellent bargains, especially if your time is limited and the trek happens to fit your schedule. If you are on an organized trek, whether it’s a lodge or camping trek, the sirdar’s resources will include only the food, equipment, money and instructions the trekking company has provided. No matter how scrupulous the arrangements and how experienced your sherpa staff, there will be some complications. A trek is structured according to a prearranged itinerary and the sherpas expect to arrive at certain points on schedule. If you are sick or slow, and do not tell the sherpas, you may discover that camp and dinner are waiting for you far ahead. Be sure to communicate such problems and other desires to the staff. Most sherpas are true professionals. They will make a lot of effort to accommodate you if they understand what you want. If you do not wish to follow their daily routine, you must decide this early in the trek. A routine, once established with the sherpas, is difficult to change. A usual condition of a group trek is that the party must stick to its prearranged route and, within limits, must meet a specific schedule. This means you may have to forgo an appealing side trip or festival and, if you are sick, you will probably have to keep moving with the rest of the group. You also may not agree with a leader’s decisions if the schedule has to be adjusted due to weather, health, political or logistical considerations. Previous post: How Long to Trek in Nepal? Next post: What kind of Trekking in Nepal?